Those of you who have been following my blog might be wondering where I’ve gotten to. It’s not often I keep the bike off-road over the winter, but with the repairs to the BMS, the expired MOT (inspection certificate) and the horrible weather I decided put the bike aside for a while to focus on work and other things that needed seeing to. Now that the nice weather has returned, I’ve put the bike back together and started breaking in the fresh cells in the rebuilt pack. 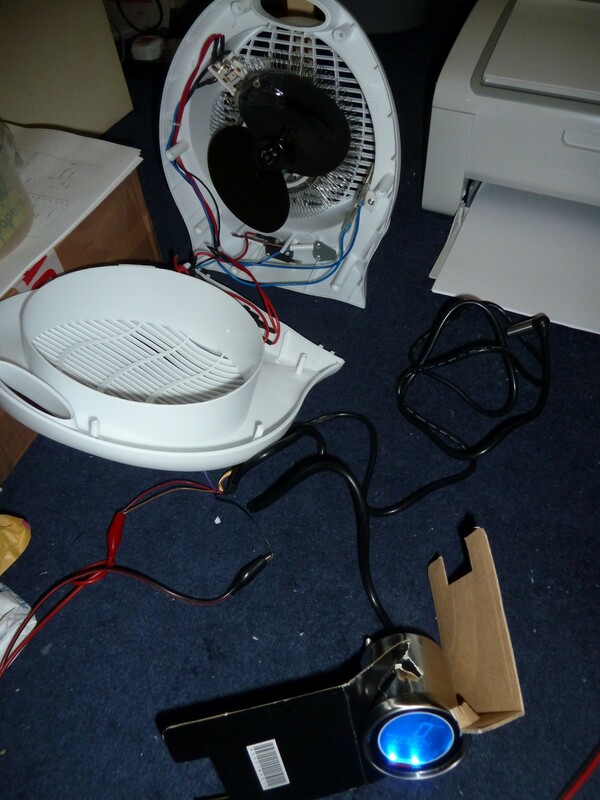 The perspex that I had screwed onto both sides of the pack had become quite broken up, and needed replacing too. Using little screws to secure the perspex to some of those little orange pegs on the cell holder seemed like a good idea at the time, but stresses from the less-than-even road surfaces I have to contend with daily were making the pegs break off and wearing away at the covers, breaking bits off and sending cracks through them. It was also fiddly having to undo a lot of tiny screws every time I needed to do something to the pack. So now I’ve settled on a more basic arrangement. I replaced the perspex with fresh sheets, but just used clear packing tape to hold the sheets onto both sides. It’s not as pretty and elegant, but has the free play to deal with road vibration and will make servicing of the pack easier in future, though now I’ve got the LVC safeguards in place, cells will probably not need replacing for a good long time. Breaking in the pack has been fairly routine. Because the new cells are out of balance with the others, the Zephyr goes into pulse mode at the end of a charge cycle, and needed keeping an eye on to make sure it didn’t get too hot. But three charge cycles in and it’s almost all balanced out again, with the EOC cutting off promptly with very little pulsing. I was quit relieved about this, as I’d had to replace a few components on the Zephyr BMS after a weak cell died in mid charge and damaged one of the cell circuits (see last blog entry) — something that could have been avoided if I’d been more careful and fixed it as soon as the warning light on the Zephyr LVC system started coming on. Though I was getting resistance readings on the newly repaired circuit that were exactly the same as the other circuits, I couldn’t be sure all was well until I’d run it on the pack itself. Happily all appears well, the pack is more balanced, and it’s cutting off when it should do at the end of a charge cycle. The bike has a new test certificate now so I’m finally back on the road, however some work will need doing to the bike soon: The terrible road surfaces, high speeds and a period of carrying 48Kg of SLA (lead-acid) batteries has taken its toll on the bearings of the steering column. There’s just a little bit of free play there, top and bottom, and so I’ll have to get this seen to before its next inspection. It’s proving impossible to get the specs for the runners and bearings needed for this bike, so I’m going to have to do it the expensive way and get a proper bike person to deal with this. Though I like to do whatever I can with my own hands, I’d rather leave the more technical mechanical stuff to a proper mechanic. 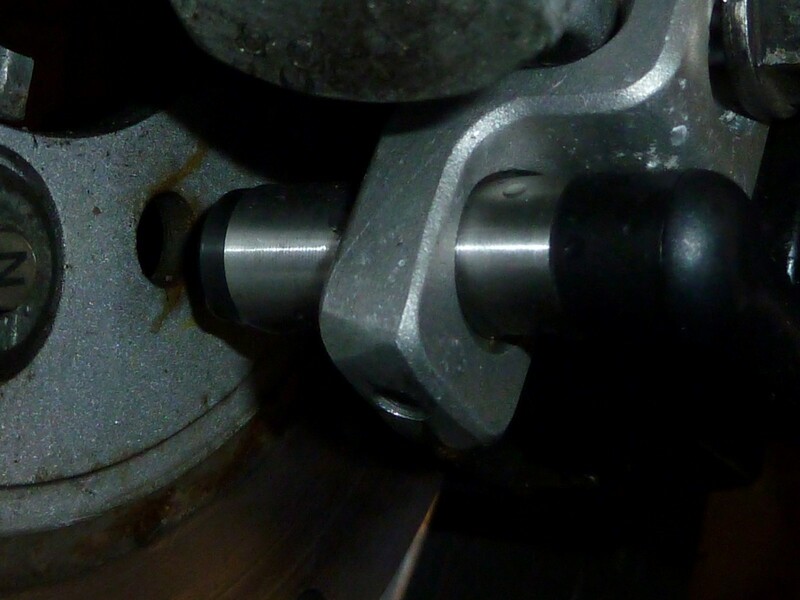 Bearings are particularly important now with the bike being as powerful as it is, and I want to make sure it’s done properly with quality, ‘race standard’ parts. 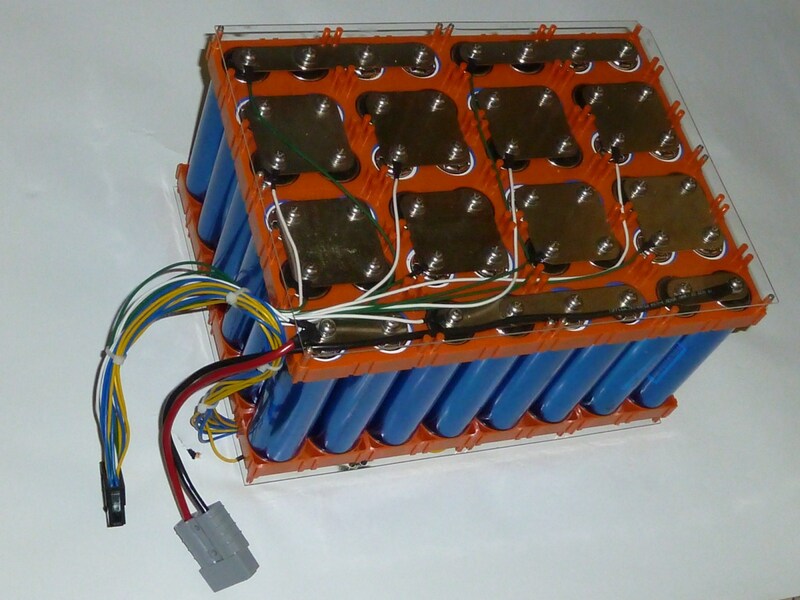 The thing about Lithium cells is that they have to be treated with a certain amount of care and respect. You should get plenty of notice if cells are deteriorating. Weak cells throw the pack out of balance, taking longer to charge, and losing their charge more easily, lowering the capacity of the battery pack and the mileage you can get between charges. A while back, I finally got the cell-level LVC circuit of my Fechter Goodrum BMS up and working with my throttle and a warning light on my dash. If any cell goes below a certain threshold, a red warning light comes on permanently as an urgent alert to check my pack or give it a good charge. Since I typically recharge my pack well before it shows signs of flagging, I had hardly gotten to see it in action. But one day when I was about to nip off to the supermarket I noticed that it was on. Checking the pack, I found that a slightly weak cell-pair had suddenly become a very weak cell-pair. This was one of the casualties from running the pack without an LVC system for so long, – I’d had to replace some cell-pairs when I’d run the pack almost flat a couple of times by accident (albeit over a 3 year span), but there was still one pair that was a little on the weak side but still serviceable. So when the little red light came on I was not entirely surprised, – the damage it had taken a couple of years earlier had finally caught up and the cell-pair was on its way out. If I’d been sensible, I’d have just pulled the pack there and then and taken the bike off the road, but I’d become quite dependent on the bike so thought I would run it a bit longer while I ordered a replacement pair of LiFePO4 cells. Unfortunately, though, this isn’t such a good idea, as if you’re charging a pack and a cell-pair dies for good, this can result in damage to the BMS. So when, a couple of charges later, I noticed the charger was taking longer than usual, I should have unplugged everything sharpish rather than just leaving it to terminate of its own accord, which – in this case – meant turning the BMS’s corresponding cell-circuit turn into a giant fuse, burning most of its components to a crisp until the charger cut off automatically when it all shorted out. Taking the pack apart, the cells were clearly in quite a bad way. The cells themselves weren’t really the issue here, though. The real problem was the blowback onto my beloved, home-built BMS. The main FET had initially born the brunt of it, burning itself to a crisp and leaving the big resistors on the back looking a bit ashen. 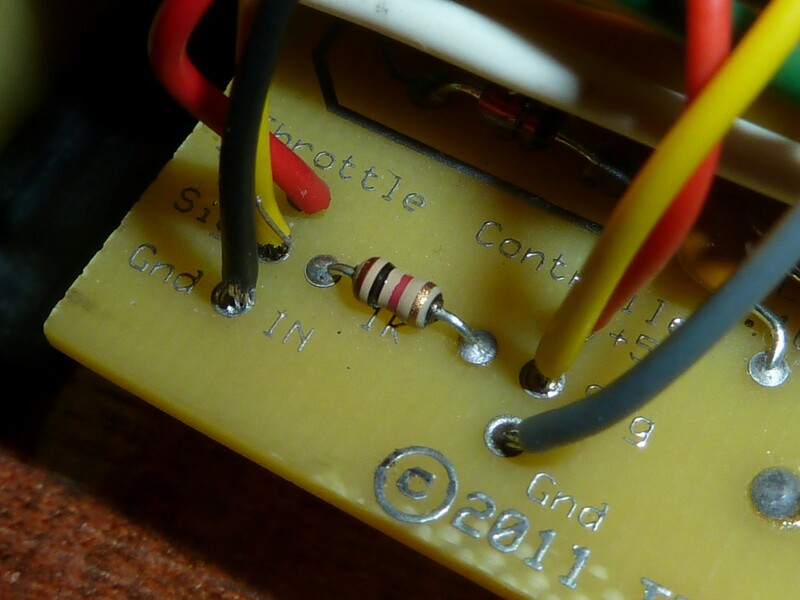 The big resistors were still apparently alive, but given their condition (and the fact that they’re pretty cheap) I elected to replace them with other affected components. 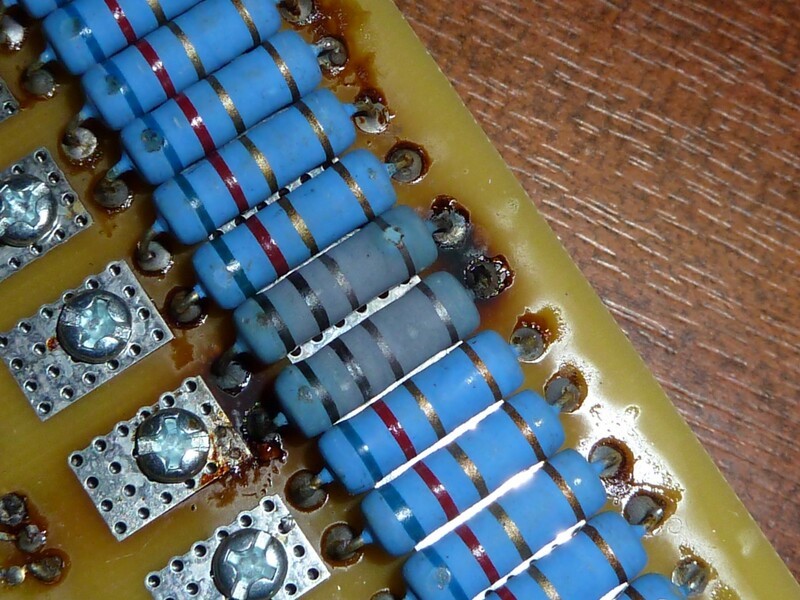 The capacitor here was also toast. 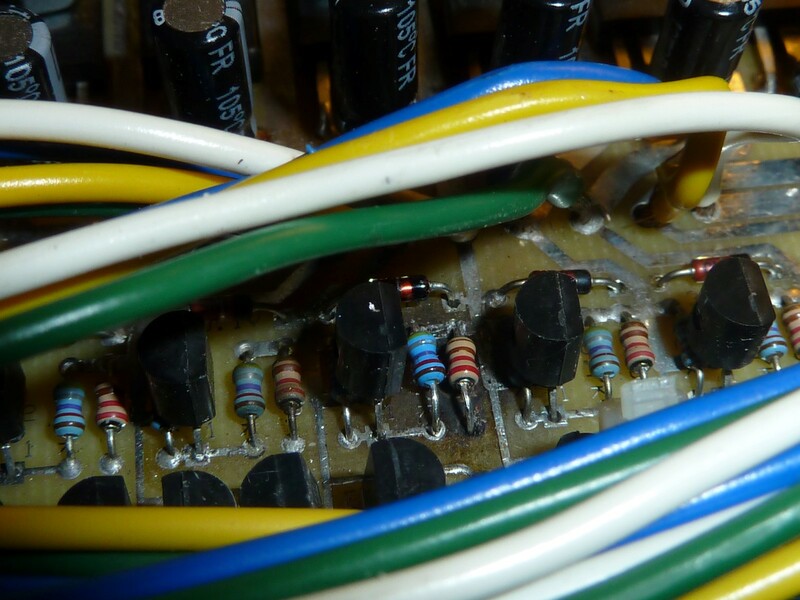 The poor little 48.7KΩ and 220Ω resistors are almost totally destroyed. 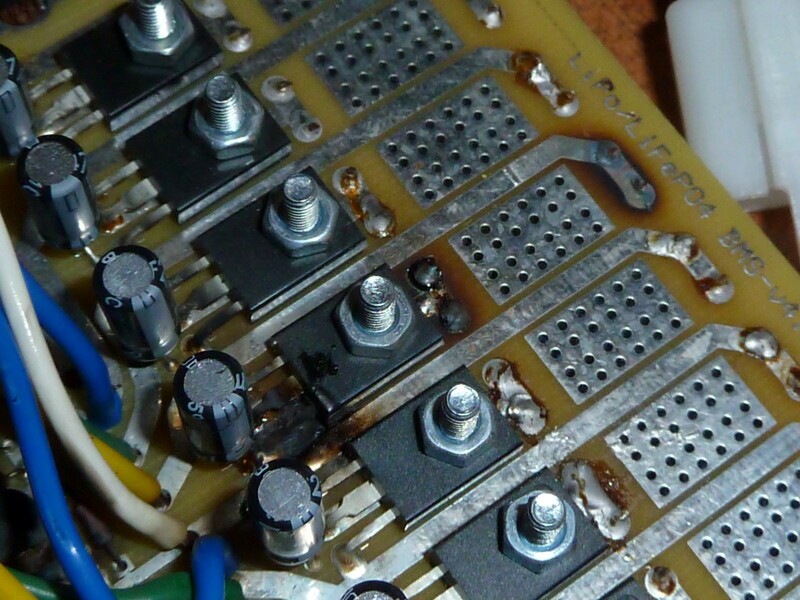 I think that as soon as the FET had burnt out and shorted, the power that would ordinarily be burned off as heat through the big resistors was channeled to the little resistors, which were pretty much totally destroyed. That – in turn – would have triggered the charger to shut down either via a signal from the BMS control circuitry, or the charger’s own safety cut-off. Either way, the charger checks out okay, so all I had to do was fix the circuit. My basic game plan for fixing the circuit was simple enough: Replace anything clearly burnt to a crisp, test other components and replace any obviously defective ones, then run resistance tests across the circuit until I got a result very similar to that across other cell circuits. One of the good things about these boards (Fechter Goodrum v4) is you really don’t need to know much about how they work to fix them: you can compare resistance meter and continuity readings between various bits of a dead circuit, and then compare those readings to any of the neighbouring circuits that are working. 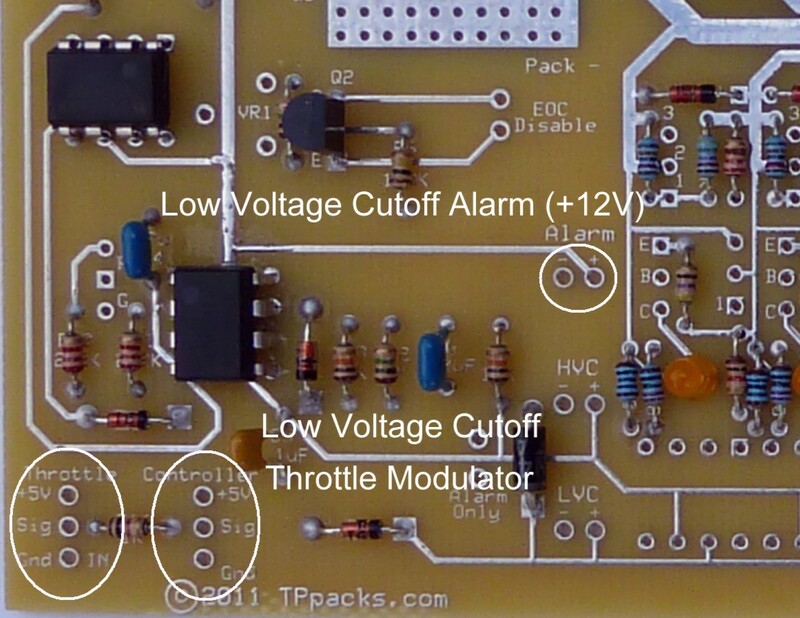 If you don’t get the same resistance readout across your circuit after replacing something, then just keep replacing things until you do! I took the FAN431 next to the frazzled resistors out too, as well as the diode, then replaced the top diode and resistors with fresh ones. Next, in went a fresh FAN431. 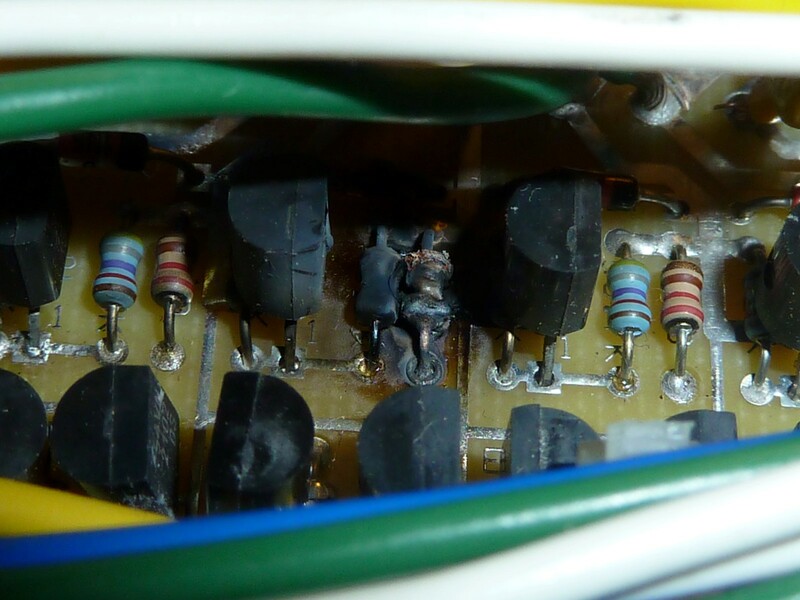 The 2906 transistor was shorted so I removed that and the 47Ω resistor next to it, which was also burned out. The TC54 transistor next to it came out too, since replacing all the the 2906 and all the other stuff still hadn’t restored the correct resistance readings for the circuit. 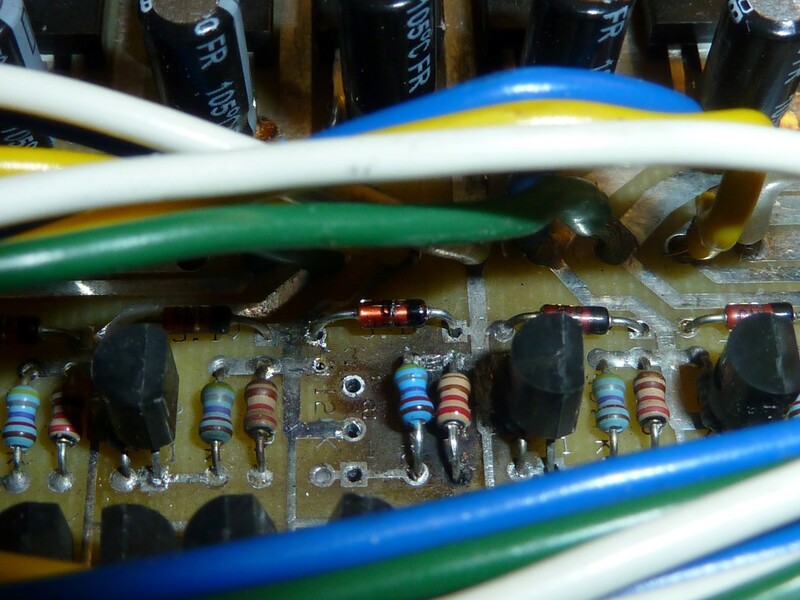 With the 2906 and the TC54 transistor replaced I just had one problem: The 47Ω resistor was on back order, and not due in for another couple of weeks. Fortunately this didn’t affect my ability to test the circuit, I just temporarily stuck a larger 1/4W resistor of the same value into the holes to check the circuit. I’m getting all the right readings, now and it looks all ready for a proper test. 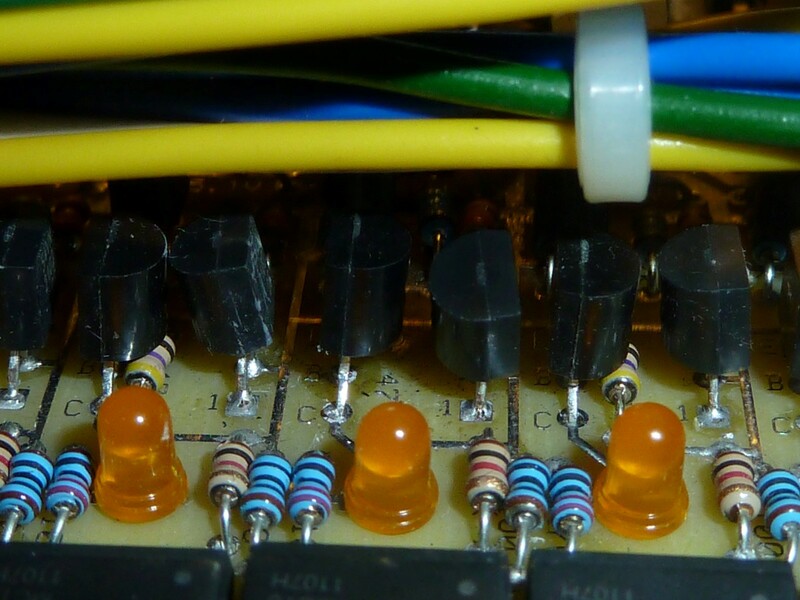 I just have to wait for that one little set of 47Ω 1/8W resistors to arrive in the mail. For anyone interested in joining the exciting world of homemade battery management systems, check out my thread for the Fechter Goodrum “Zephyr” 4.4 boards, which I also sell in my shop. I’ve had mine for nearly four years now, and this is the first time I’ve managed to do any damage to it. The take home message from this is of the stitch-in-time-saves-nine variety: There’s little point in having a great, cell-level, LVC system and battery monitor that warns you of weakening cells if you don’t heed the warning signs and red lights and keep chancing it with further recharges. Change weak cells sooner rather than later, don’t tempt fate by ignoring the warning signs of a dying cell-pair, and don’t continue to charge them until they die right in the middle of a charge cycle. The batch of Fechter-Goodrum 4.4a Zephyr boards I had made back in November sold out a few weeks ago, and I’m getting enquiries from people who missed out on them. Unfortunately, though, I’ve been a bit short on cash, so can’t afford the outlay to get a fresh batch made. 4) The component labels and values have been tidied up and moved to the silkscreen layer, where they’re easier to read. 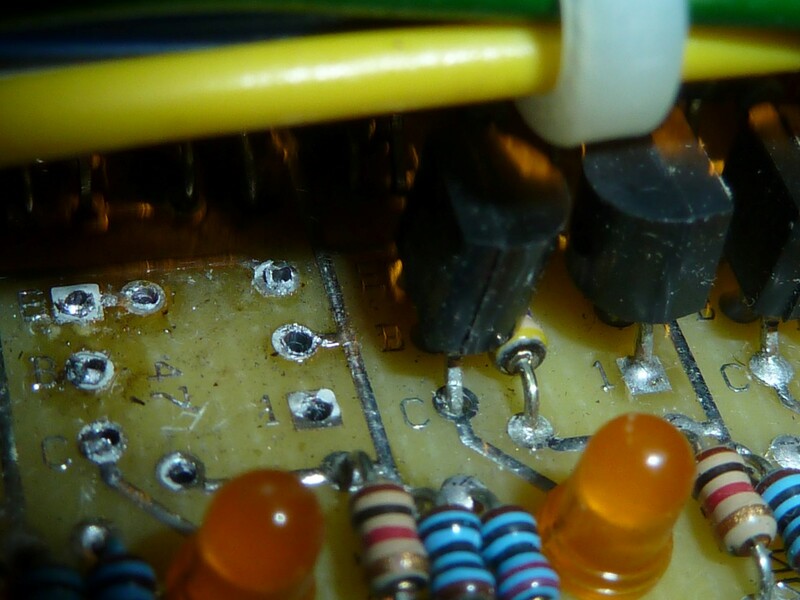 For those of you with 4.4a boards who think you might need the diode modification, you can easily ‘patch’ your existing board by adding the component as described on this Endless Sphere post. As for my bike, there’s been nothing much to report recently. The bike and pack continue to work fine, and I typically get 15-20 around-town miles before the LVC system (the on-board, Fechter-Goodrum one, no less) starts to trigger the red, warning LEDs that tell me it’s time for a charge. So little to go wrong with these bikes once you’ve got them figured out. I am still on the look-out for a more powerful hub-motor, though, but I’m still finding it hard to come by ones more powerful than the 1500W one I already have. If I can get hold of a 2000W one, and confirm from the weight that it’s probably more powerful than the one I already have now, then I’ll give it a go and see if I can get more performance. Have a great summer! 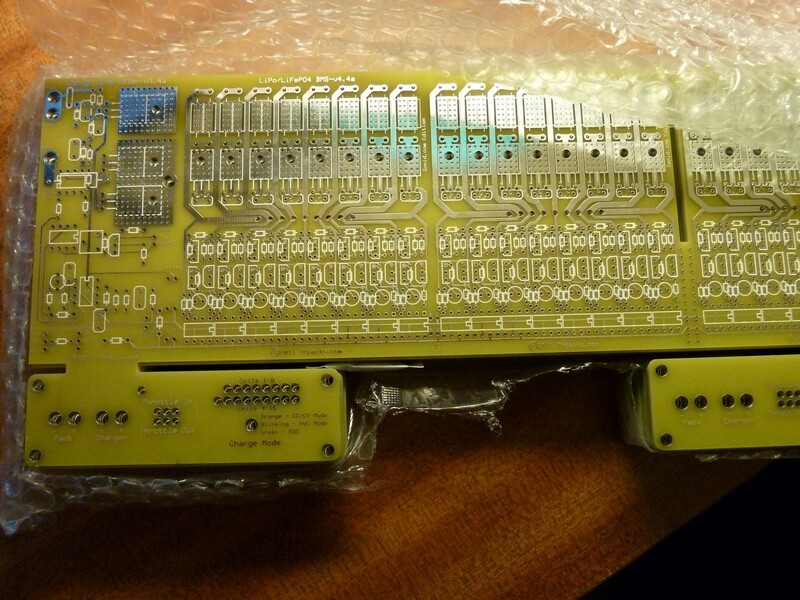 It’s been nearly two years since Gary Goodrum and Richard Fechter made the controversial decision to put the welfare of their families before their obsession with exotic BMS designs, and suspended development of their now-famous BMS boards. Ever since they ceased trading, though, there’s been an unremitting stream of posts and queries asking after the boards and bemoaning the fact that they had pretty much ceased to exist. 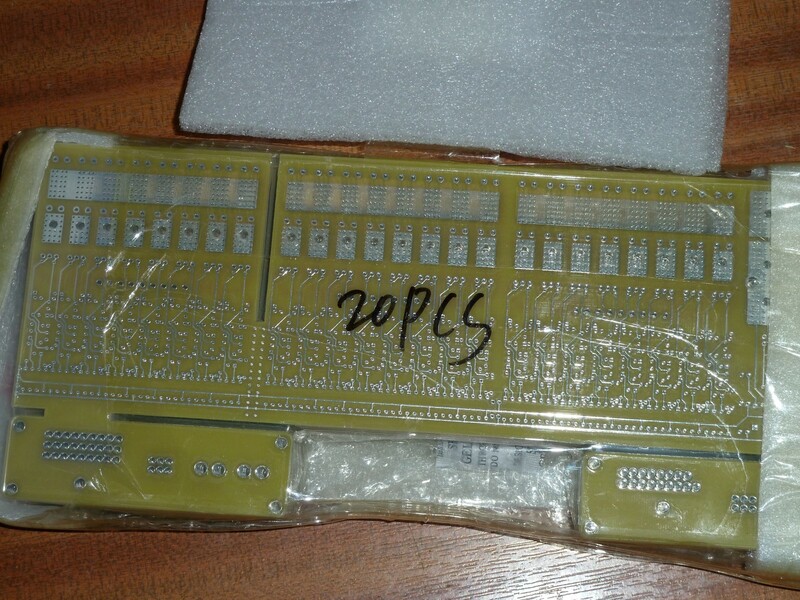 Thanks to the wonders of cyberspace though, the designs were very much alive and well, and Richard Fechter seems more than happy to hand over the PCB cad file to anyone who was prepared to sink their own money into having some made. Challenge accepted! 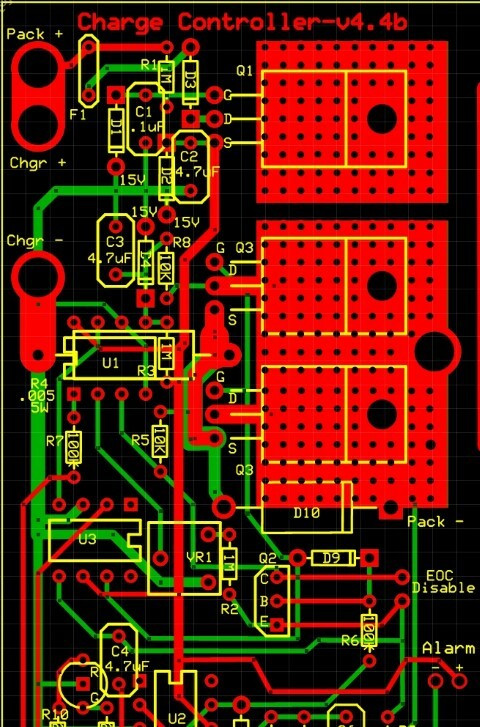 So after crowbarring open the proprietary ExpressPCB file format into a universal format that all PCB manufacturers use, I got a bearable quote and put through an order. 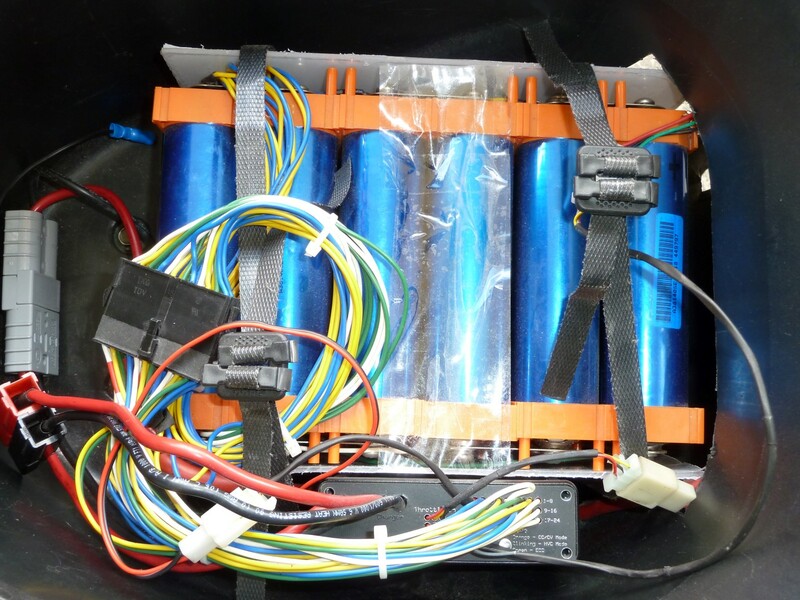 For those of you who haven’t heard about it, the Fechter-Goodrum v4.4 BMS is a cutting edge LiPo/LiFePO34 pack charging & balancing system that includes a built in, fully-featured, cell-level LVC/HVC system, with a throttle pass-through and various alarm connections. Naturally, the designers will get their cut of the profits once I’ve sold enough to break even. The margins are thin, but hopefully renewed interest in the units and a trickle of investment will keep the project moving forward or at least treading water until EV technology becomes more widespread. So I’m the proud owner of a batch of the latest version of the Fechter-Goodrum Zephyr, version 4.4a. 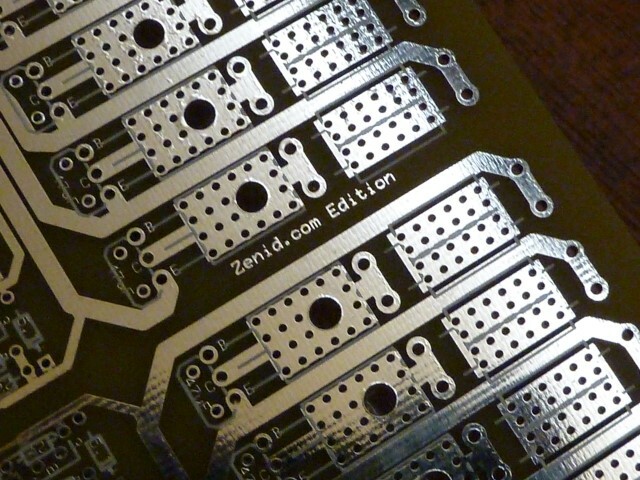 They’re almost identical to the one I used in the Zephyr unit I built, except the ones I ordered have a silkscreen print of the components to make it a little more user friendly (and pretty). Of course, I had to add my own personal touch, and “Zenid.com Edition” discretely adorns the edges of each 8-channel section. So there you have it, folks. 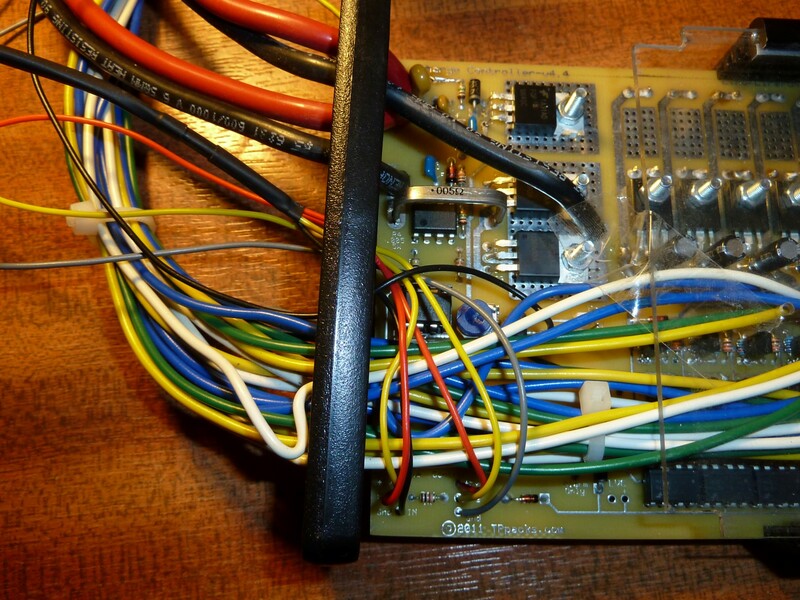 If you need a solid and dependable BMS/LVC system, and love to make things yourself, you might consider building one from the ground up. All the relevant parts lists and documentation can be found in the shop and on the Zephyr thread of Endless Sphere. 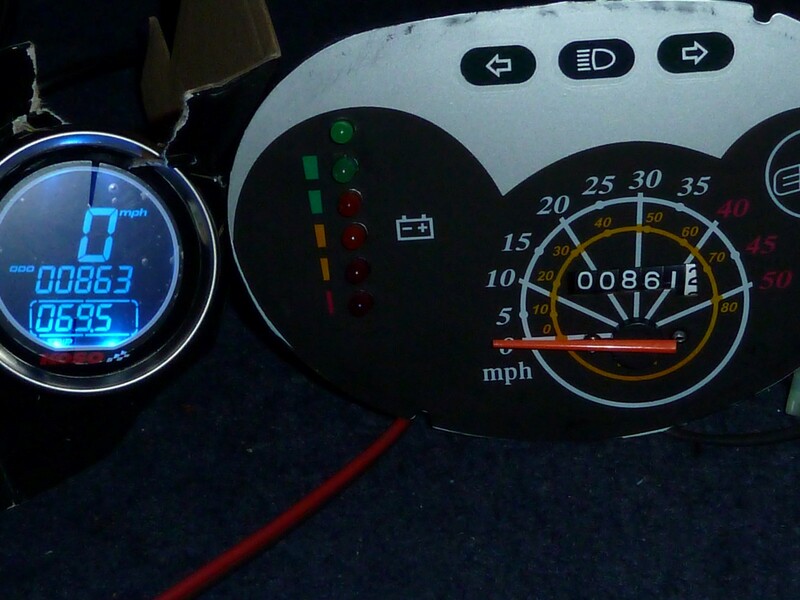 My new, digital speedometer and the old one (inset). A trip count reset button (red) has been installed to the right. 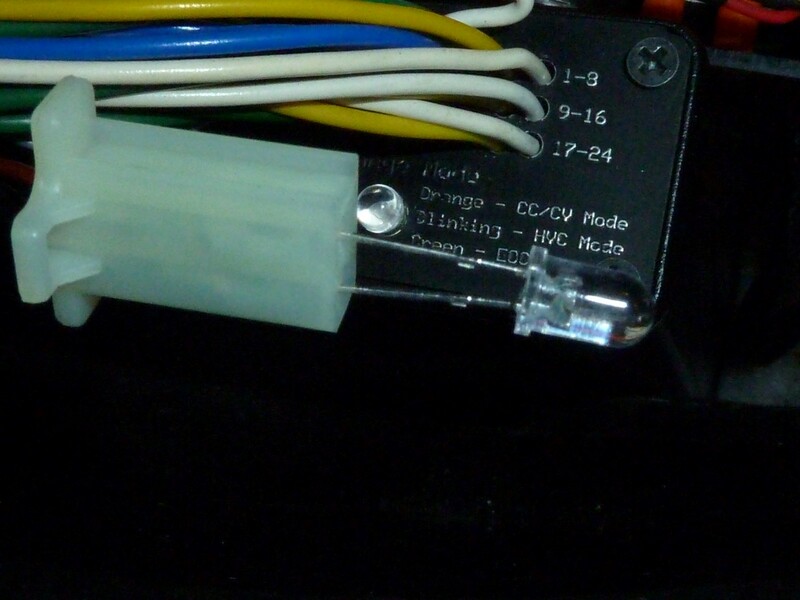 If you saw my recent post detailing my speedo driver problems, you might have been left with the impression that I was able to get mine fixed and back to normal. Unfortunately that wasn’t quite accurate. That little coupler that needed adjusting and putting back in after it failed the first time eventually gave out completely. At first it started making these horrible noises, which would come and go at random, then the speedo packed in again completely. 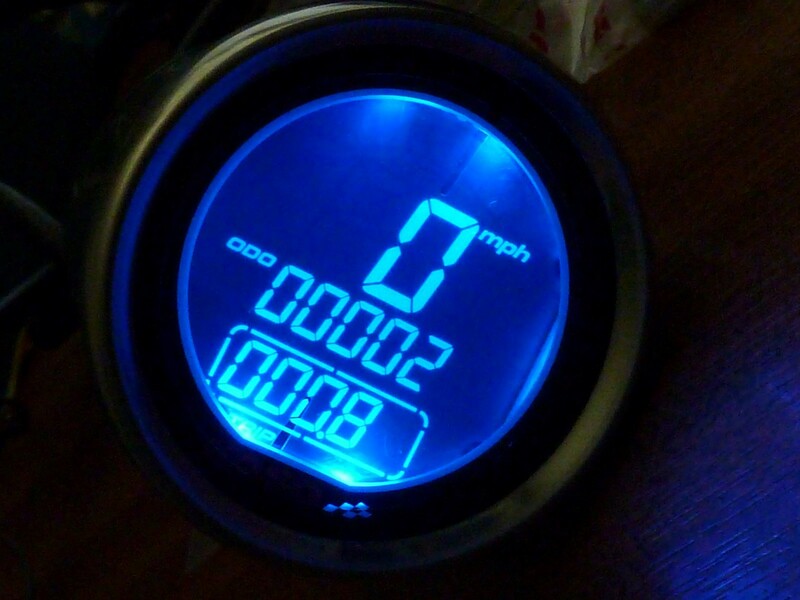 It occurred to me again just how little of the life of the bike the speedometer had actually worked for: Out of the 3 years I’ve had the bike, I think it only worked for a year before it clapped out shortly after I’d installed the Lithium pack. I decided then that it was time to rethink the problem, which was that the speedometer/odometer that came standard with the bike was an antiquated and cruddy piece of work that has well and truly had its day. I had considered a digital speedo before, but was put off by the sky-high prices many were asking for such devices. Though they are in principle no more complicated than a £10 watch or multimeter, some of the prices being asked for basic customisable units were pretty astronomical, which I put down to the niche nature of this market. In the end though, I managed to identify a suitable unit for a price that was within my budget. 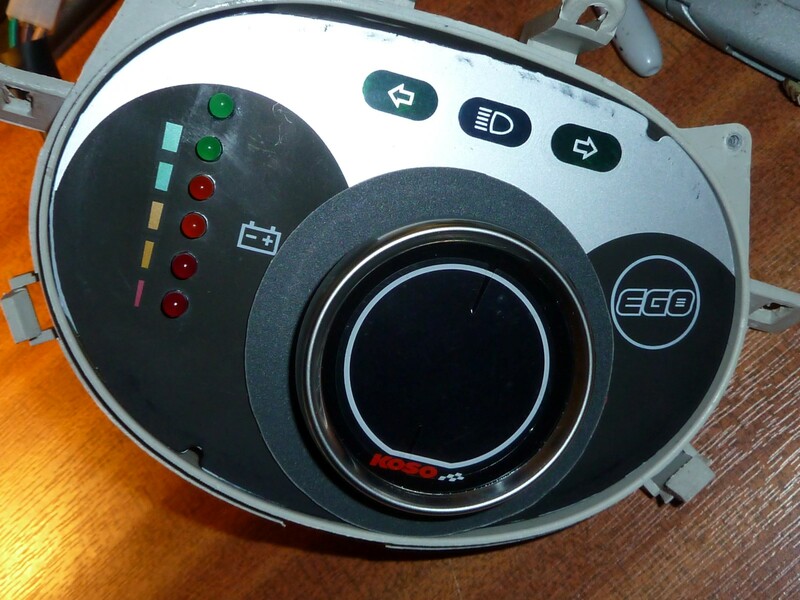 I ended up with a KOSO DL01s Speedometer, ordering one with the optional button-on-a-lead so it could be operated externally. This unit has five wires, and one sealed cable. Two of the wires them are for a signal from a fuel level gauge, but it’s designed for fuel vehicle setups, and whatever is usually connected to ordinary fuel level instrumentation. That will have to wait for now, but a fuel gauge is not a problem any more because I finally have a working LVC (low voltage cutoff) system that gives me plenty of warning via the LVC alarm lights. 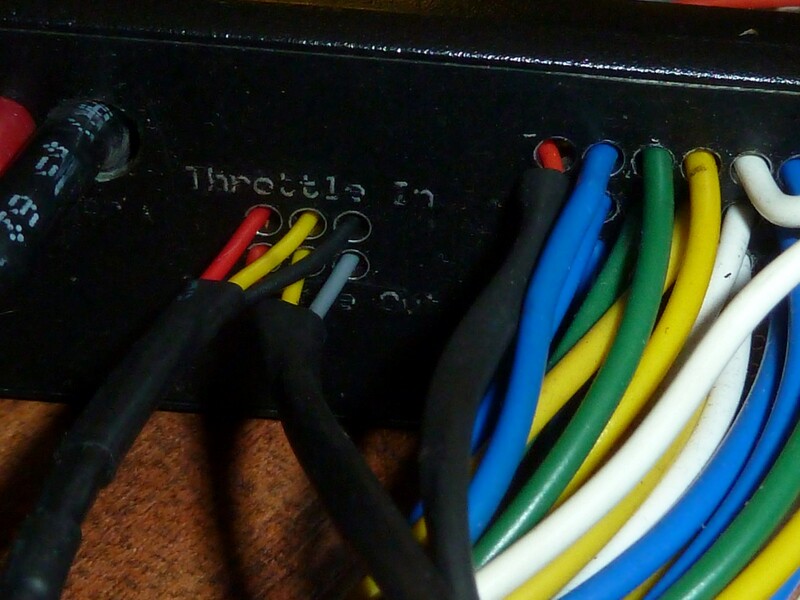 The other three wires are the ones that are particular importance – the black, the red, and the brown. 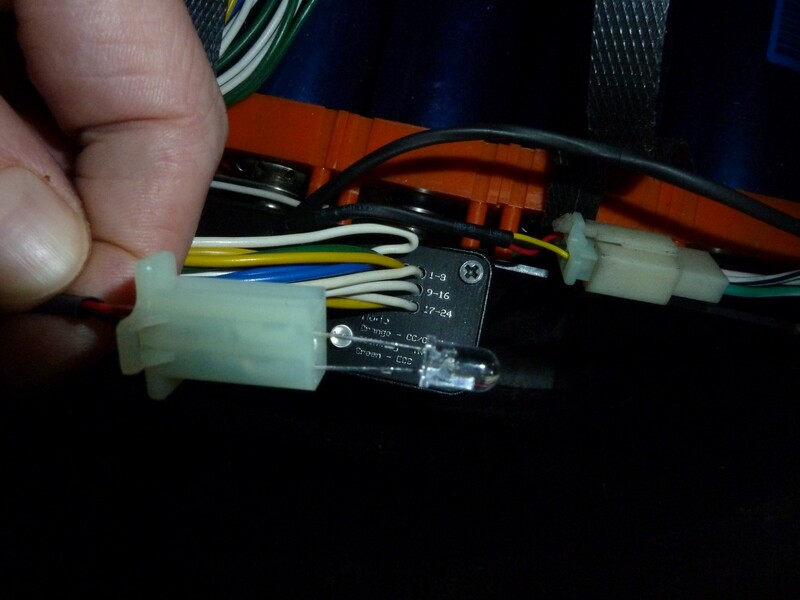 Herein lay a slight problem: Since the designers assumed that all vehicles have a permanently available 12V power supply via the battery, it has been designed to have a small part of it ‘always on’, so that it knows that it doesn’t have to run a ‘bootup’ test sequence. 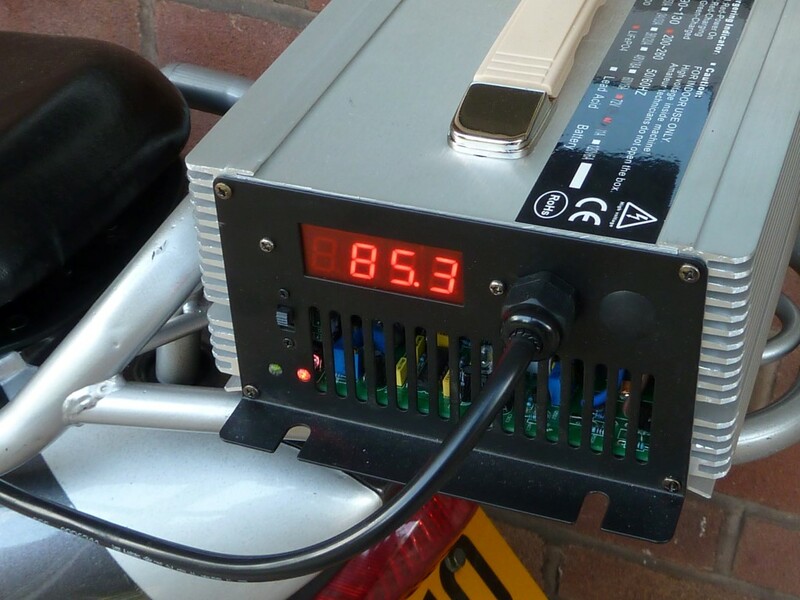 However, the 12V system on electric bikes is not ‘always-on’. 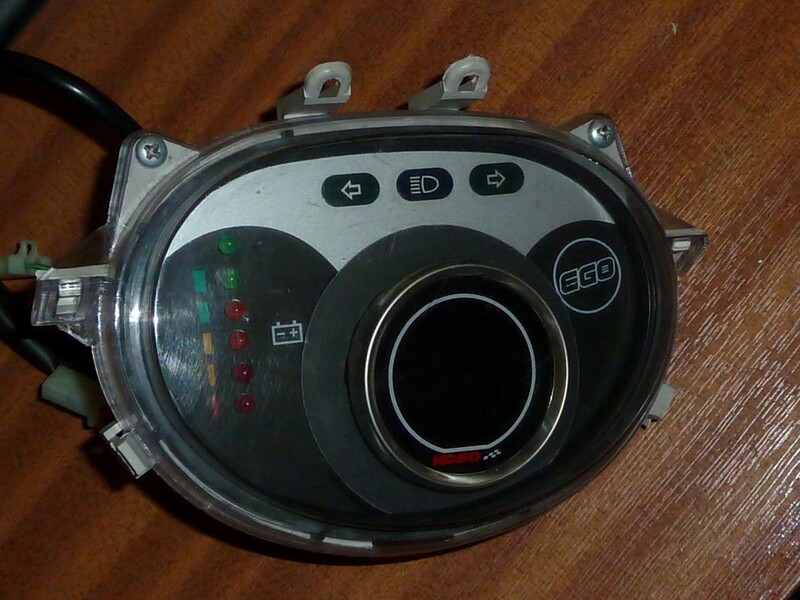 It needs the ignition key to be turned before the system gets its 12V. One way of dealing with this is simply cross-wiring the red and brown. 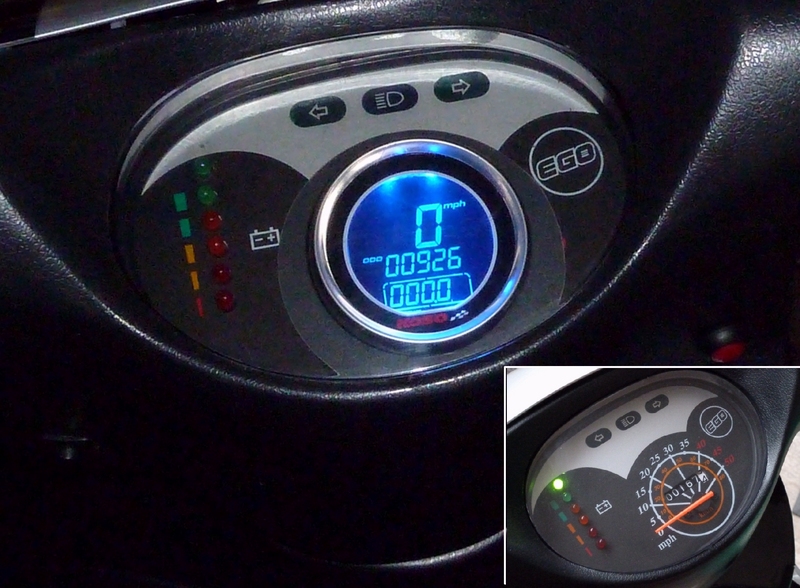 This means that you always get the little test sequence when you switch the bike on, but it’s fairly brief and not much more than the sequence you get on the dashboard of many cars. One thing I could do, I thought, was take a wire directly off the Lithium pack at a series interval of approximately 12V. This would mean a choice between the third cell – with a 9.6-10.8V range – or the fourth cell – with a 12.8-14.4V range. 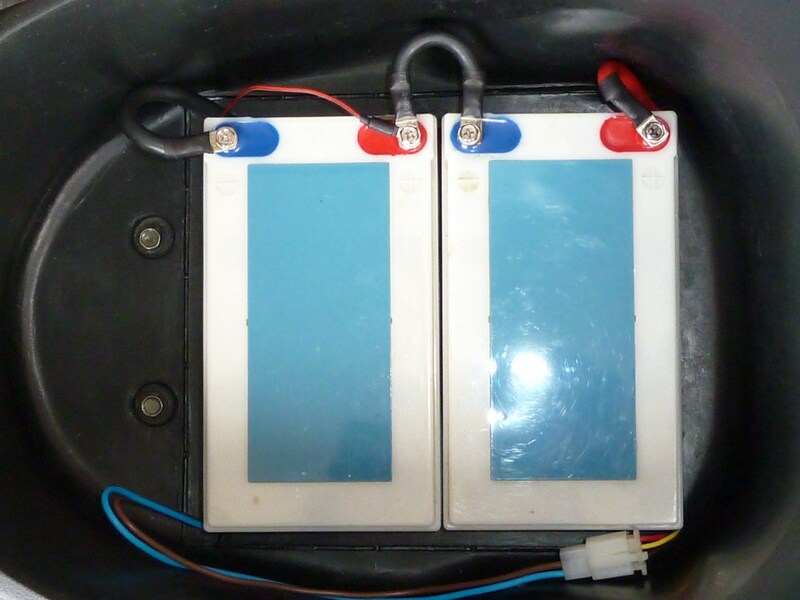 The problem is, that the unit might be working on the assumption that the 12V it receives through either part of the circuit is the exact same voltage, as it would be both sources were from a single car or motorbike battery. However, my understanding of how these things work is limited, and I’ve decided not to risk damaging it by breaking any design assumptions they might have made. 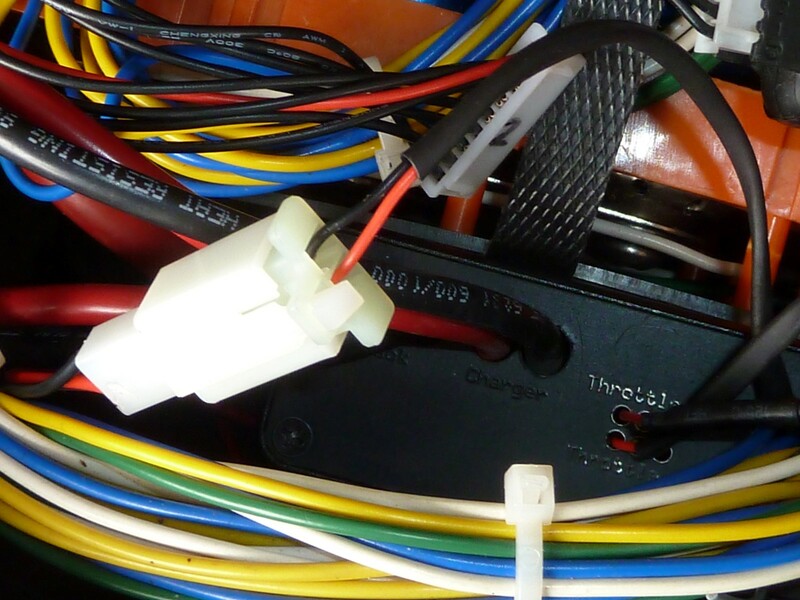 In my arrangement, these three wires are run to a male, two-way mini connector, with the brown and the red wired together and receiving input from the 12V system. The black, of course, goes to the ground of the electrical system. Another problem with many of these units is that you cannot set the odometer and thereby transfer your existing mileage across to the new unit. This is a predictable and understandable measure taken to prevent unscrupulous vendors from trying to mislead people over a vehicle’s mileage, however with a little bit of imagination, a cheap fan and some strong tape, it’s possibly to use a simple but effective, brute-force approach. Above, you can see where I dismantled a fan and stuck one of the magnets onto the forward furthest facing part of the blade. 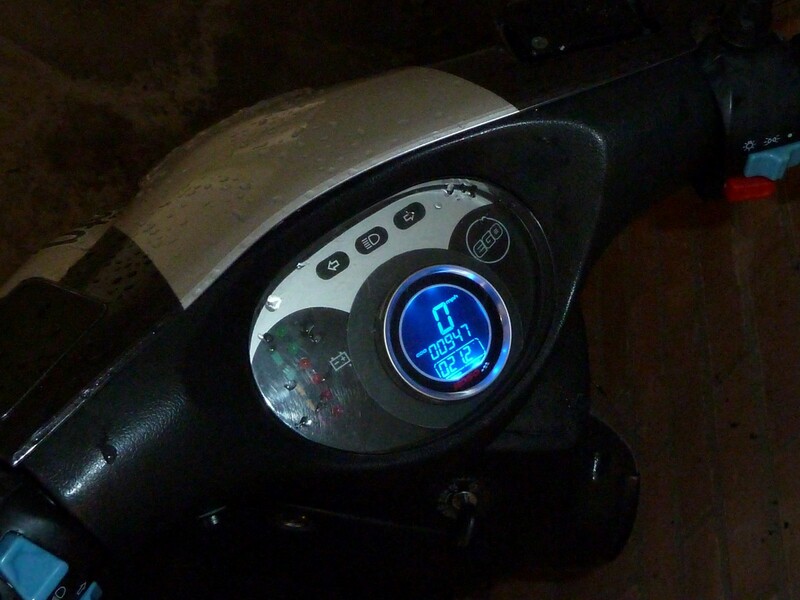 After putting it back together, I now had a great way to quickly put miles onto my odometer! 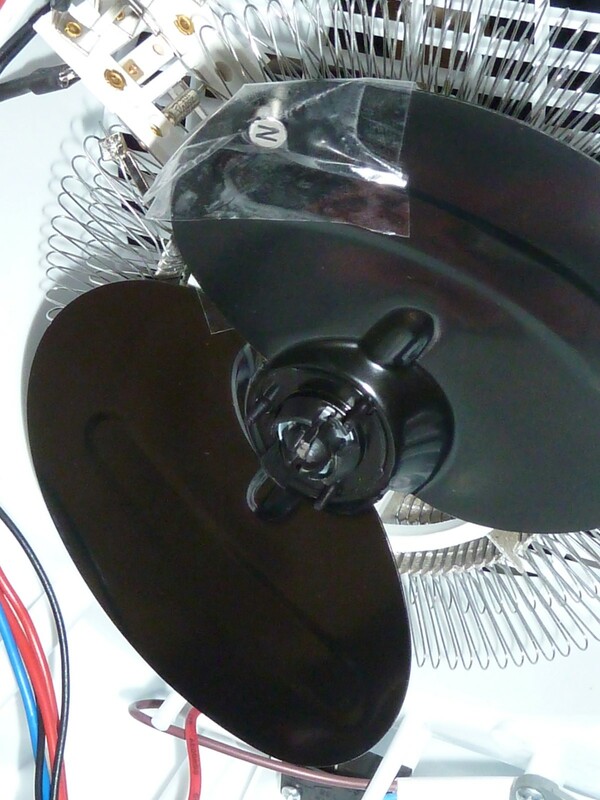 I wedged the probe into place between slats on the front of the fan, such that it was just a few millimetres away from the magnet. The speedometer had been set for the largest possible wheel size (about 2.5 metres circumference, or 80cm across), and so this arrangement gave me the fastest possible virtual speed. There’s a short video clip of this setup in action here. 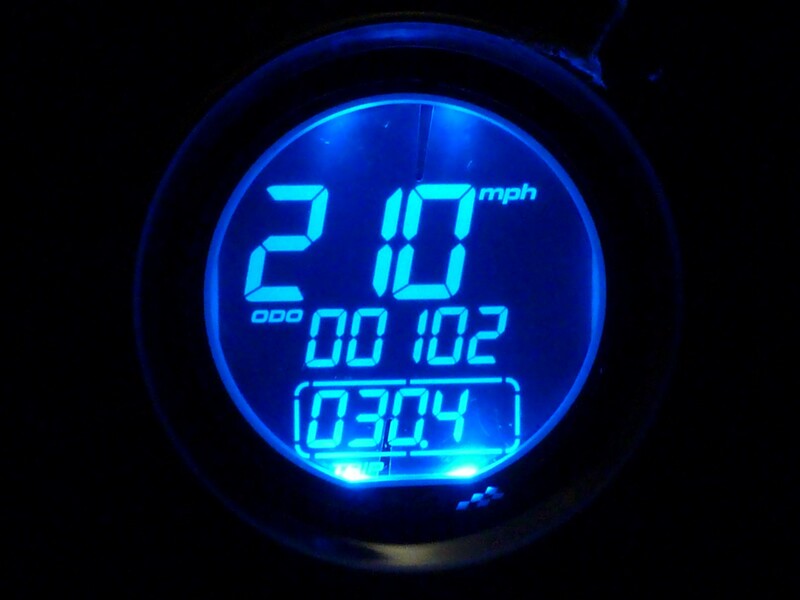 After four hours or so at up to 210mph, the speedo had clocked up the amount of mileage logged by the existing, rubbish one that was about to be cut out, thrown away and replaced. And just as evidence that the new speedometer now has more or less the same mileage as the existing clocks, here they are together once the speedo’s virtual journey is complete. 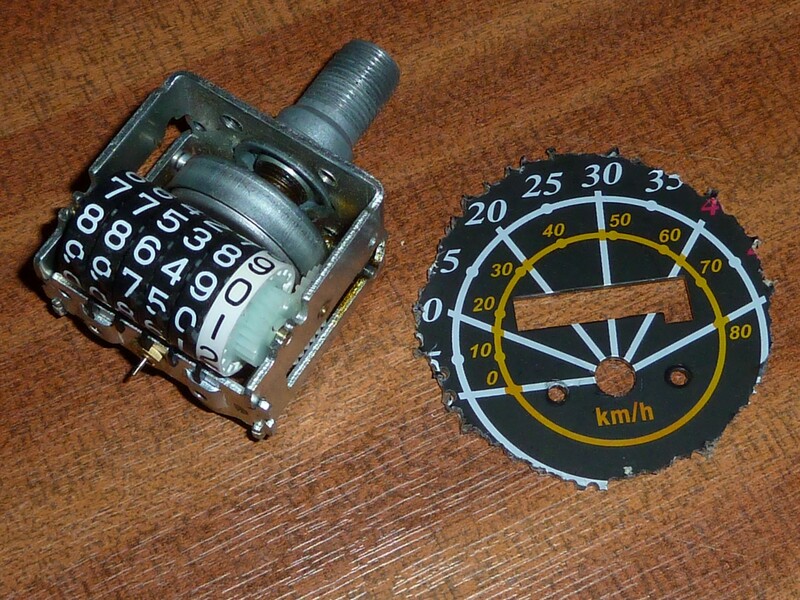 The next stage was to remove all the antiquated, clockwork junk comprising the old needle display, and then cut a hole custom-sized for the new unit, which was around 55mm at it’s neck. I couldn’t find a scroll saw with a thin enough blade, or that could really cut curves in metal, so I drilled lots of little holes in a circle of the diameter I wanted to cut out, then used some snippers/wire-cutters to cut between them, et voilà. Bolts protrude from the back of the unit. 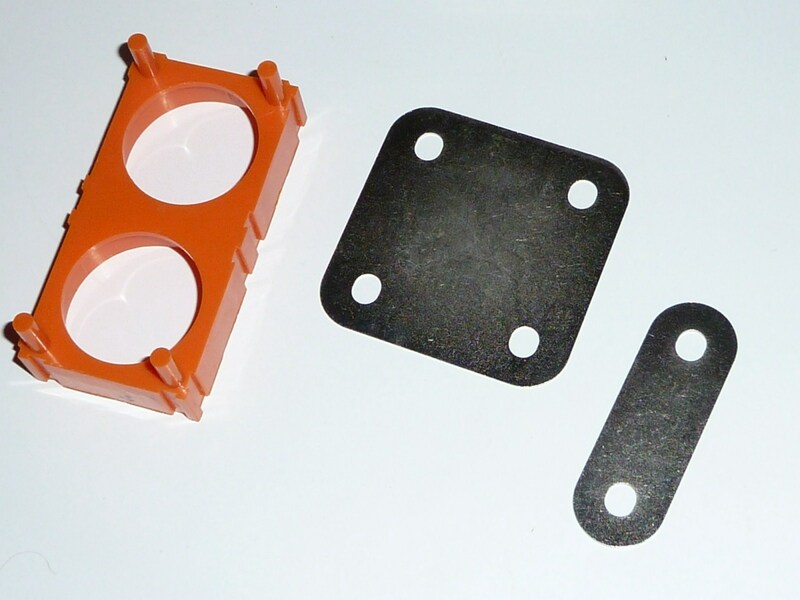 and I drilled suitable spaced holes such that it could be secured to the plastic housing using the nuts provided. Here it is assembled as a preview. 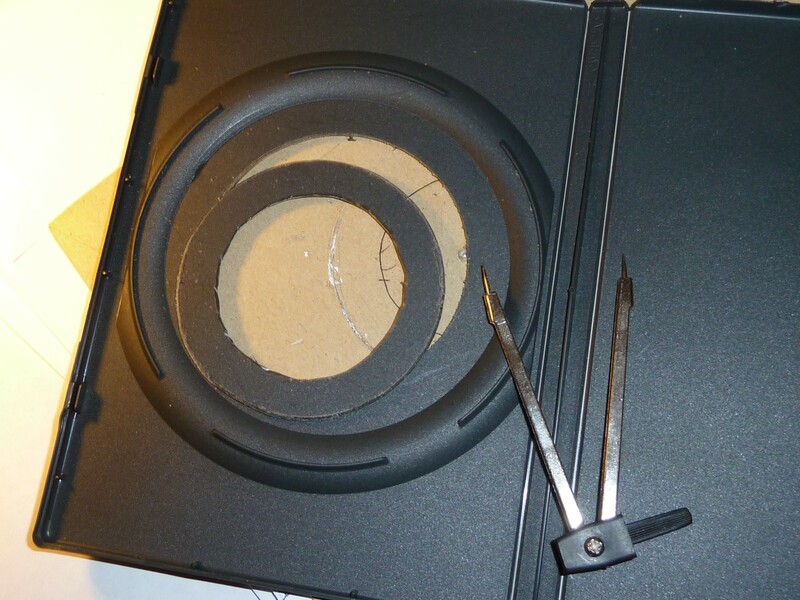 As you can see, the hole that needed to be cut was quite jagged due to the lack of more expensive cutting tools, so I needed to make a cosmetic ‘collar’ from something that was more easily cutable. Eventually I realised that a matt DVD cover was almost perfect for the job. I used a stencil to cut a collar of the right dimensions. And here it is partially reassembled with the collar in place. Much tidier, I think. And finally, the display unit has been completely reassembled, complete with power connector, and is ready to go back on the bike. So now I have the display all reconnected and wired in so that it will power up when I turn the ignition key. 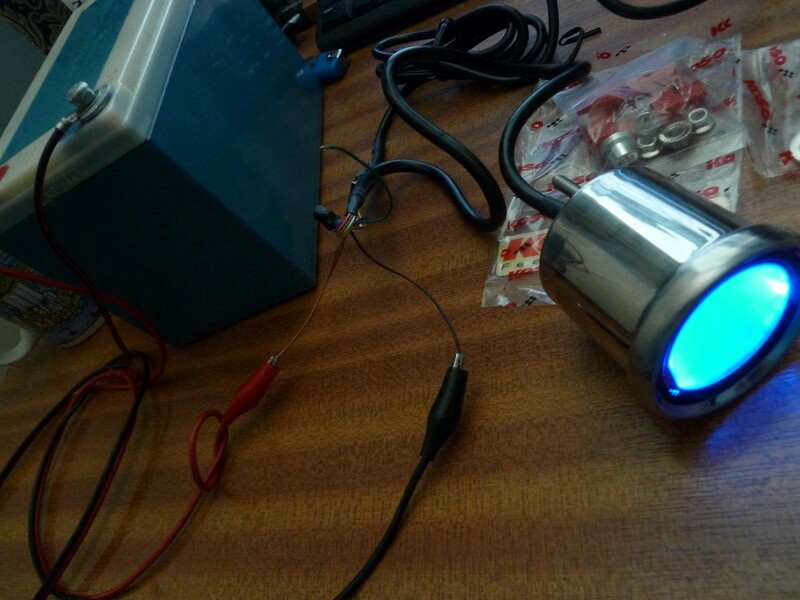 But there’s still the matter of the sensor and the magnets that it takes its readings from. 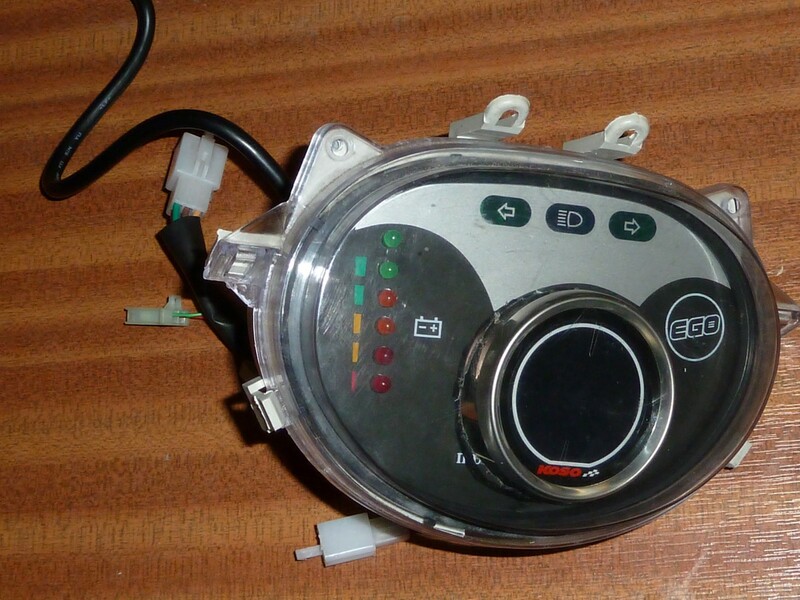 The makers have come up with a clever way of using the mechanics of the brake disc and the brake caliper assembly to make it quite easy to fit the speedometer to pretty much any motorbike imaginable. 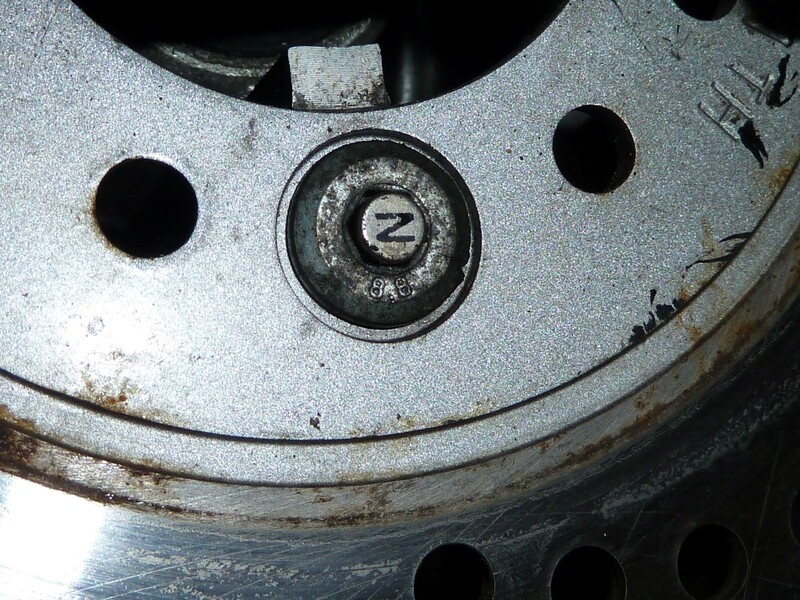 The brake disc is secured by a number of Allen bolts – on mine it’s three. You simply put the little magnets included into the sockets on the boltheads and that’s it! They’re held in place by just being magnets. The only thing you have to do is make sure the North pole (“N”) points outwards, to where the sensor will face. 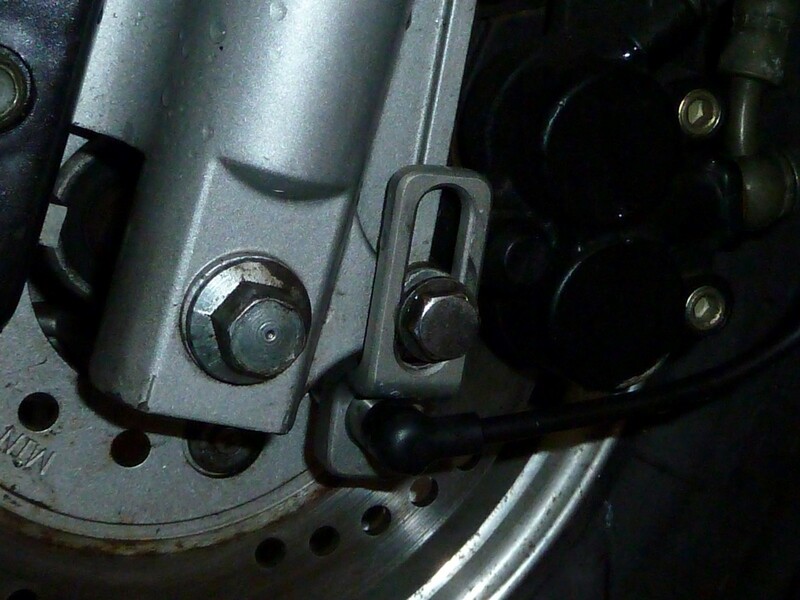 Below, you can see the bracket and the sensor itself mounted by the front brake calipers. The bracket is secured in place using the same bolthole that secures the brake calipers. It’s finely adjustable, and needs to be set so that it passes over the magnet fairly close to it. I ended with mine about 5mm or so. The little electrical cable for the new sensor is secured by cable-ties to the hydraulic line running from the calipers up to the handlebars. Below, you can see how the sensor is adjusted. A grub-screw in a recessed hole at the base of the bracket is tightened to secure the sensor – which can slide in and out – at just the right distance from the magnets on the brake disc. Once I had the whole up and running, there was a certain amount of fine-tuning to be done. 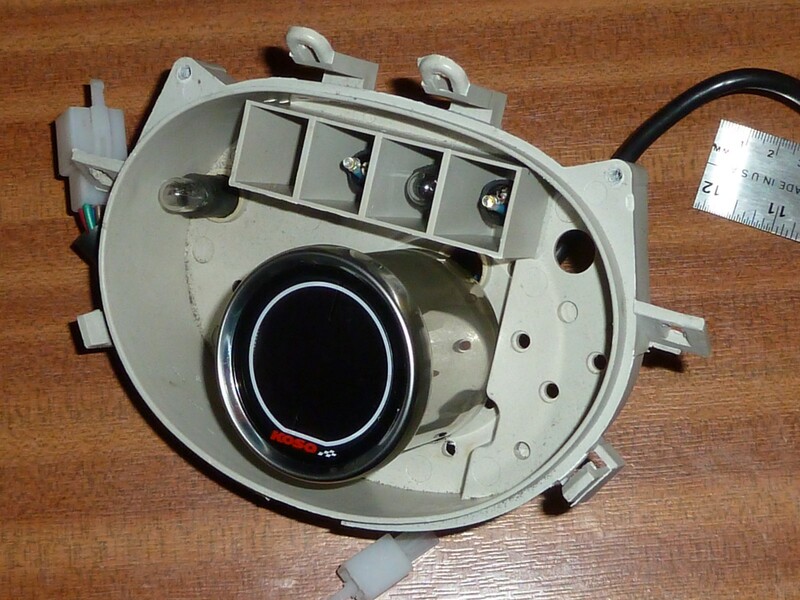 The unit needs to be programmed with a figure for the circumference of the wheel in milimetres, and the number of sensor magnets being used. Though I had both of these values calculated reasonably accurately, the speedometer was quite drastically out, reading about 40% of what it should. I ran past a roadside speed detector/display a couple of times, comparing my readout to that of the sign (someone else has my satnav at the moment) to help calibrate, and soon had it to within 5% or so, which will do for now. One consequence of this upgrade is that you can now dispense with that cumbersome cable driver that goes with the regular, mechanical driver, and get rid of that big bracket that secures it to the bike. I find that the steering moves a bit more smoothly now without that cable clunking back and forth. 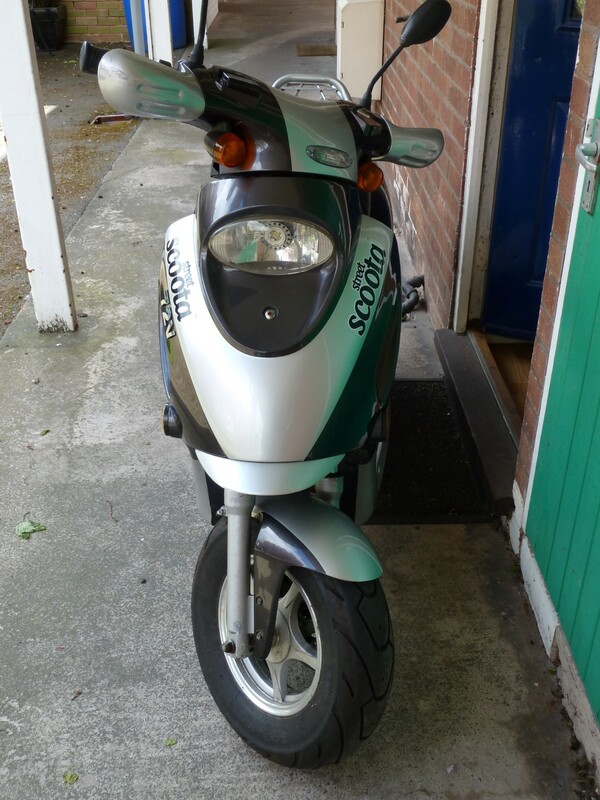 In my last blog I neglected to mention an unfortunate incident that happened while I was getting everything fixed and ready for the bike’s MOT inspection. 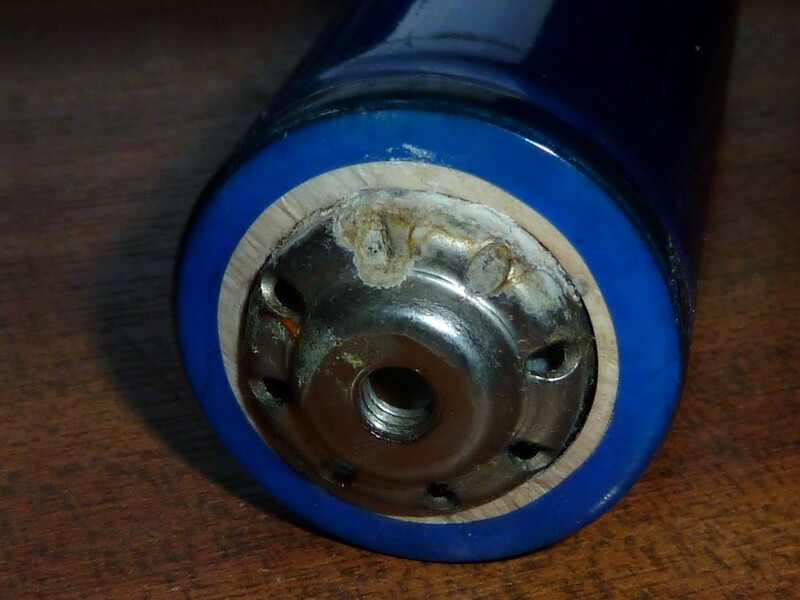 I was in my kitchen (which looks out onto where I’d left my bike charging), when there was an almighty bang – like a firecracker going off – that came from the general direction of the bike. 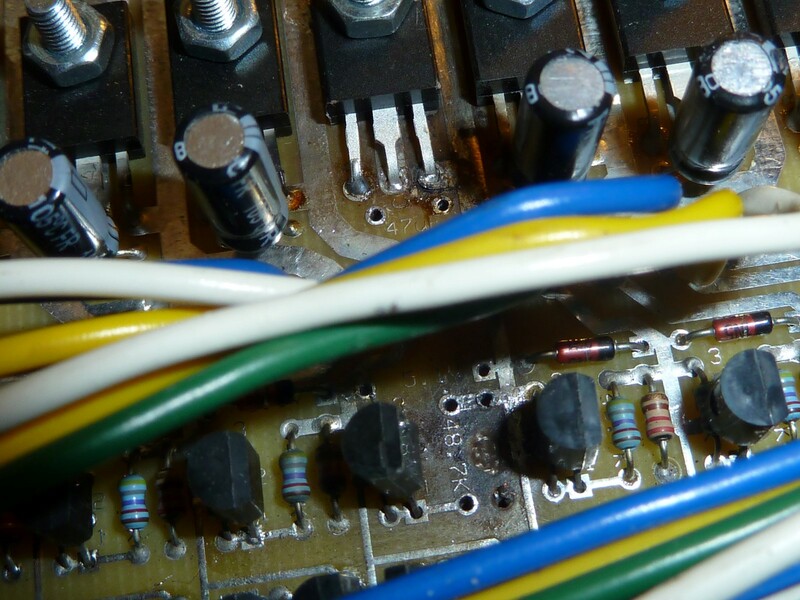 I went out to investigate, and straight away could smell the telltale odour of fried electronic components. At first I was worried that it might have been my BMS (battery management system) that had failed. I had built it from scratch from a circuit board and around 3000 components (see the ‘Zephyr’ BMS build), and so it was irreplaceable, and I didn’t really fancy the prospect of taking it apart and diagnosing it, especially since it would probably mean hassling Richard Fechter, one of the designers of the BMS, for help fixing it. 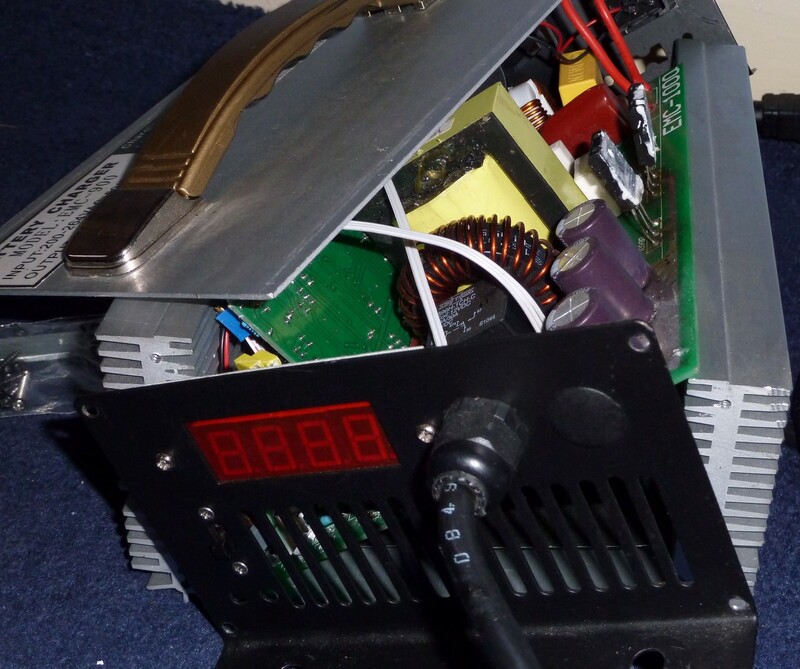 Fortunately though, the source of the explosion turned out to be my trusty (until that moment) EMC-900 charger, which was easily replaceable, though not especially cheap, especially with the £50 international shipping, and obscene import charges, taxes etc. 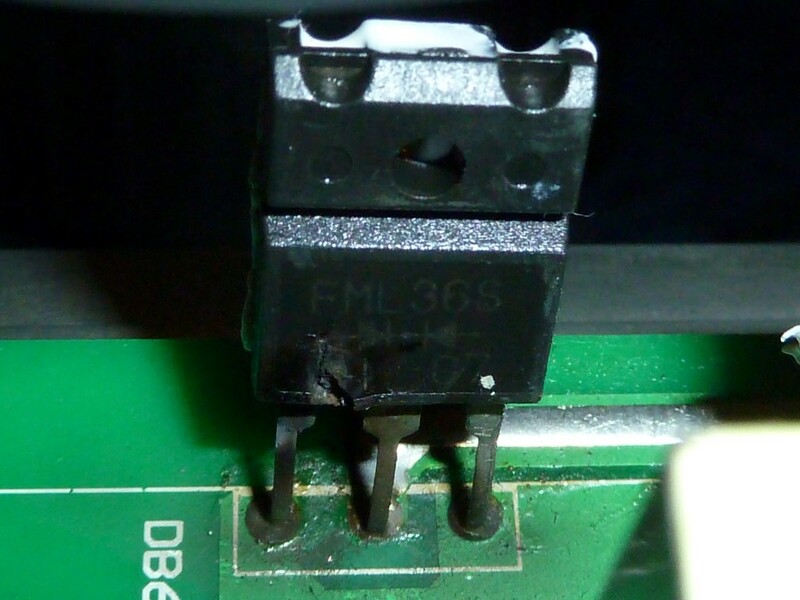 Opening the charger, I soon found the source of the problem: A FET had exploded. I briefly considered trying to repair it by just replacing the component, but quite often when a component fails, other things also fail that aren’t so easy to track down and diagnose. Checking my BMSbattery account while I browsed around for a replacement, I noticed that I’d bought my charger 2 years and 3 months previously, so I couldn’t really complain about the service life I’d gotten out of it, especially since I’d been using it almost on a daily basis for months at a time. Looking through the chargers available, it looked as though the EMC-900 had now been retired, however the more powerful EMC-1200 was available for just a little bit more, so I ordered one of those instead, speccing 85.6V and 11A output, with an anderson connector for the power output cable. 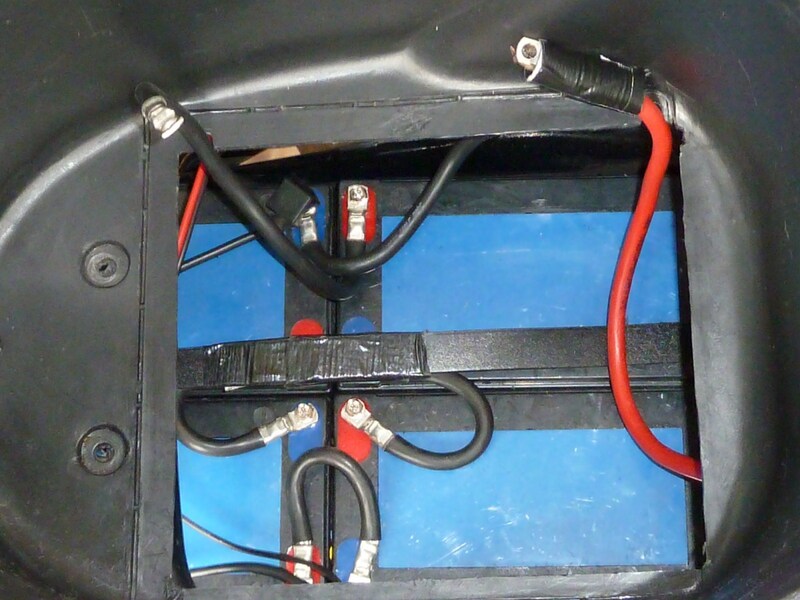 Since the outside of the unit was identical to the EMC-900, it would also fit fine in the topbox I made for it, so that I could have it fixed to the bike if I needed to go anywhere I’d need a recharge to get back from. 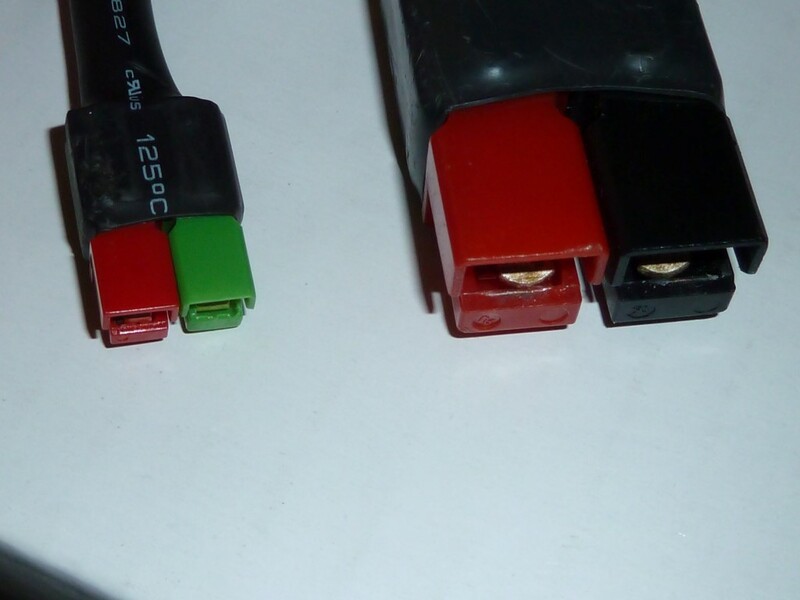 Unfortunately, I’d forgotten to specify “50A” anderson, as I did with the old charger, so the one I ordered ended up with the piddling little connector below left. 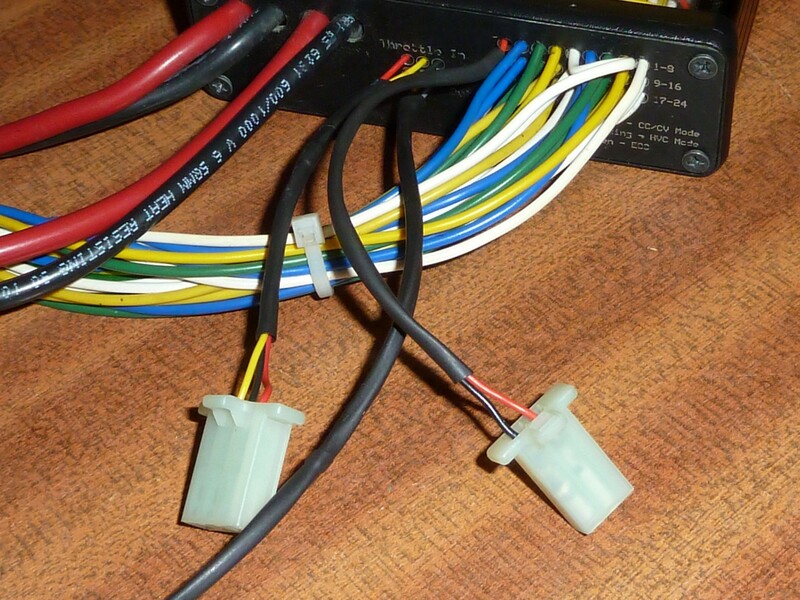 Fortunately, I had some 50A connector crimps lying around, so just salvaged the plastic connector bits from the old connector and transplanted the connector over to the new charger. D’Oh! 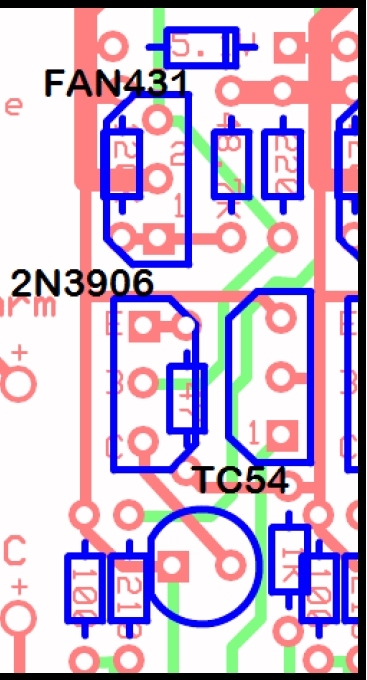 – Okay, so I forgot to specify the connector size, but then why didn’t they ask? Once up and running though, it worked fine, even cutting off the charge cycle at the exact 1.4A threshold that I’d had the BMS working at with the old charger. The model number (1200) is the power rating, 1200W, so theoretically it should be able to charge a third faster than my old, 900W version. I’ve since upped the current setting to 12A using the adjustor pots (variable resistors) inside the unit, and it’s cut my recharge time from 2 hours 50 minutes (with the old charger) to just over 2 hours (from ‘flat’), and it looks like I might be able to up the amperage a little more if I really want to push it. Lithium packs can charge at an enormous rate, and my BMS is rated for 20A, so there’s plenty of scope to improve the recharge time further if needs be. 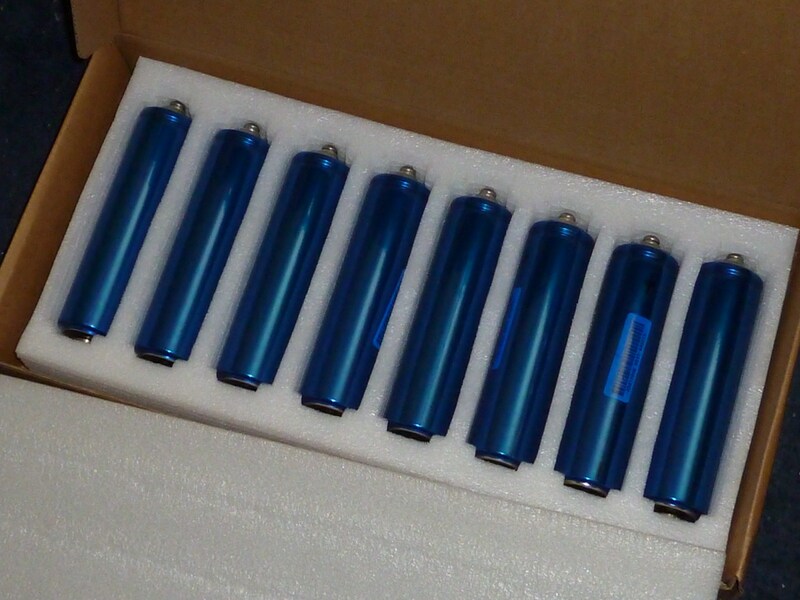 Since I also had some weak cells in my LiFePO4 battery pack that needed replacing, I also ordered 6 new Headway 38140S 12Ah LiFePO4 cells plus a mass of the orange, plastic holders used to secure them (the legs on the holders can break easily when removing them to replace cells) and a few connecting plates . I only just recently got the LVC (low voltage cutoff) throttle and alarm circuits on my Zephyr BMS working, and so had still been relying on manual checks with my pack monitor to warn me of any dangerously low cells (more about that later). 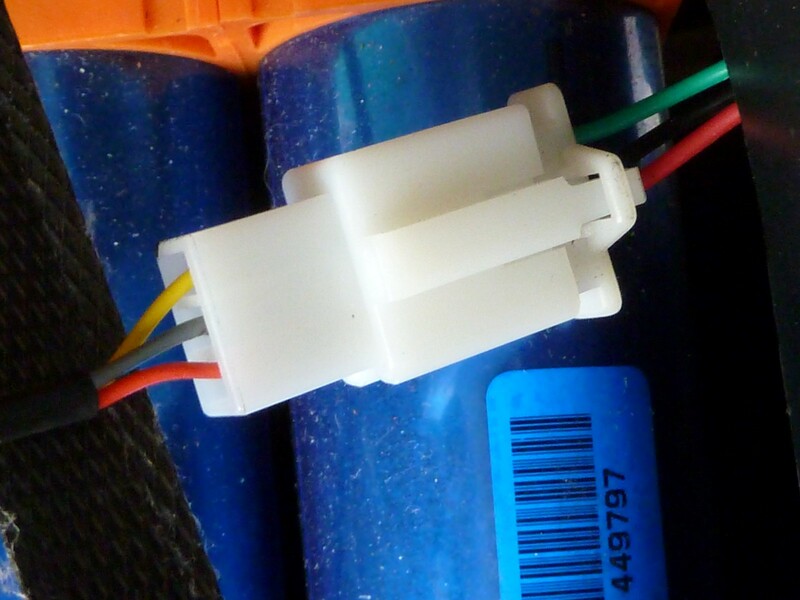 Without these proper safeguards, running it too far without a recharger would damage the weakest cells and let others get lower than they ought to as well. Hopefully, with the new LVC and alarm system in place, I won’t have to service the pack for a good, long time. You are currently browsing the archives for the 1. Main Blog category.